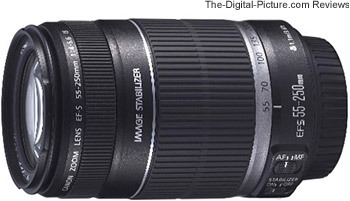 Note: The Canon EF-S 55-250mm f/4-5.6 IS Lens has been replaced by the Canon EF-S 55-250mm f/4-5.6 IS II Lens. The Canon EF-S 55-250mm f/4-5.6 IS Lens is a small, light and economical telephoto zoom with a long focal length range - one that matches up very well to many general purpose zoom lenses. As it is an "EF-S" lens, the 55-250 IS can only be mounted on Canon APS-C/1.6x FOVCF bodies. This is the first EF-S lens longer than 85mm and the first released since the Canon EF-S 18-55mm IS Kit Lens - a lens that the EF-S 55-250mm complements especially well. Somewhat unusual is that this lens was not announced in the USA until 5 months after being announced to the rest of the world. As a result, I gave up waiting and purchased my EF-S 55-250 in Canada. Like the EF-S 18-55 IS, the Canon EF-S 55-250mm f/4-5.6 IS Lens' build quality is on the low end. A plastic lens mount gives a quick indicator of where this lens is positioned in the Canon line. The focus ring is not the smoothest available. This is not, however, the worst-built lens I've used. The zoom ring is reasonably smooth (but stiff) and there is only a minor amount of play in the rings and barrel. Just the basics. You get a nicely sized zoom ring and a small manual focus ring. There is no focus limiting switch, no zoom lock, no distance window, not even a date code. Micro Motor AF (autofocus) delivers relatively slow AF but focus accuracy is not a problem. Of course, being a narrow aperture lens (relatively deep depth of field) helps in this regard. FTM (Full Time Manual) focusing is not available. Actually, the manual indicates that you should avoid touching the focus ring during AF as it physically turns. I expect that you could damage the motor or gears by restricting this movement. This lens is not parfocal (requires refocusing after a focal length change). 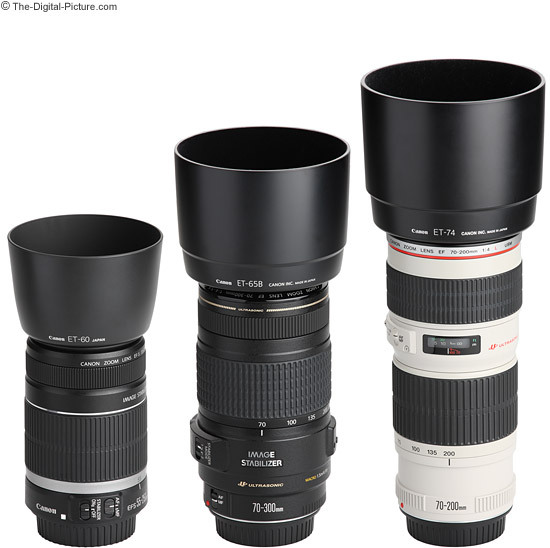 Shown above from left to right are the EF-S 55-250mm f/4-5.6 IS Lens, EF 70-300mm f/4-5.6 IS USM Lens and EF 70-200mm f/4L USM Lens. Use the mouse-over text links under the image to see the lenses in their extended positions. Obviously, the two lenses with the wider focal length ranges extend both during focusing and with focal length increases. You may also notice that the front element rotates during focusing on these same two lenses - This rotation represents an added challenge to using a circular polarizer filter as the filter itself needs to be rotated to produce the desired effect. I find the non-extending lenses nicer to use but the retracting lenses are often easier to carry when not in use. Taking another look at the same three lenses - this time with their hoods in place (above). Again, the mouseover links will show you the min and max sizes. Lens hoods are optional with most of canon's non-L lenses and this remains the case with the 55-250 IS. You should consider picking up a Canon ET-60 Lens Hood if you are taking this lens home. Take note that the lens cap is hard to reach inside this relatively narrow and deep hood. Since the inner barrel can be focus-rotated manually (the manual advises against doing this) in AF mode, attaching and removing the hood (or filters) requires a little more attention than a non-rotating alternative (the 70-300 IS focus ring does not rotate manually unless in MF mode). The lens pouch/case is also optional - the Canon LP1019 is the manufacturer-specified model, but you might consider a Lowepro Lens Case instead. The 55-250 without a hood fits snuggly into a Len Case 1N (length-restricted) and very comfortably with a hood into a Lens Case 1W. What you can easily tell from the comparison pictures above is that the 55-250 IS is small when retracted, but the above chart shows another characteristic of this lens - it is light. This lens certainly does not burden a camera bag even on a long trip. As always, add .85" (21.5mm) to the length if you need to account for the rear dust cap and the lens cap. The also-small 58mm filter size means that quality filters will not be expensive or take up much room. Below is another perspective of this compact lens. 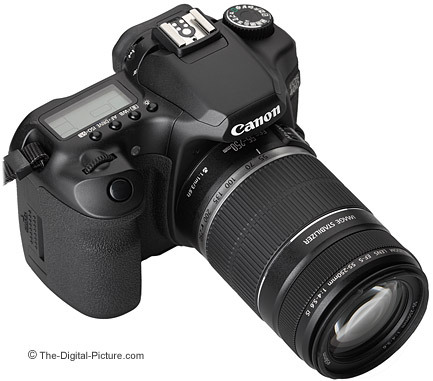 The 55-250 IS is shown mounted on a Canon EOS 40D in the above picture. Mount it on a Digital Rebel for an even more compact setup. As shown in the above table, the 55-250 IS has a short MFD (Minimum Focus Distance) which yields a very high MM (Maximum Magnification) for a non-macro-specific lens. MM numbers grow much higher still with an Extension Tube (ET) or with a 250D or 500D Close-up lens. This lens is not compatible with Canon's Extenders. I get lots of requests for lens recommendations that include "flowers" as one of the intended subjects. True 1:1 macro lenses are best for this task, but they typically lack the versatility of a zoom lens. Lenses such as this one are capable of decent pictures of flowers and other similarly-sized subjects. The chart above shows the focal length that triggers a narrowing of the maximum aperture. For example, zooming the 55-250 IS from 73mm to 74mm reduces the widest aperture available from f/4 to f/4.5. The 70-300 shows that it is capable of holding the same max apertures to longer focal lengths - just as its focal length range is longer at both ends. And of course, the fixed-max aperture on the 70-200 L lens does not change over the entire focal length range. I find this feature very helpful when shooting in manual exposure mode with a wide open aperture. All Canon lenses stop down far narrower than their wide open advertised aperture settings - typically to f/16 - f/32. I seldom shoot with an aperture narrower than f/11 as the image becomes soft due to diffraction. What the above chart also shows is that this is a relatively slow (narrow aperture) lens. The 55-250 has a circular aperture opening for more-rounded out-of-focus highlights. The one great feature the 55-250 IS has beyond just the basics is a 4-stop Image Stabilizer with vertical and horizontal auto-panning detection. With IS switched on, A half-press of the camera shutter release results in a much less jittery view through the viewfinder. Clicking sounds can be heard while IS is engaged but the sound is not loud. In careful handheld comparison testing, I can get a good 3 extra stops of handholdability at 55mm from IS with some occasionally decent results at even slower shutter speeds (longer than 1/15). At 250mm, I had a much harder time determining the specific amount of help IS was giving me. First, I find it hard to hold such a small and light lens steady at such a long focal length (that inertia rule - which makes IS even more important in this lens). And second, 250mm is the weakest focal length for sharpness. I had a hard time determining if the softness was caused by lens motion or because the results are always soft at 250mm. I love IS, but not if it only helps me get a soft image. My good faith guess is that I can get 3+ stops of help from IS at 250mm when I do my part right. 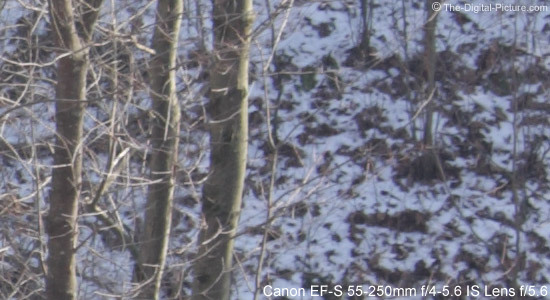 The Canon EF-S 55-250mm f/4-5.6 IS Lens is not the sharpest lens out there. While the center of the frame is not bad, the mid-way and edge portions of the frame are soft. Center of the lens performance is best at the wide end and slowly degrades at to the long end with the barrel distortion changing to pincushion distortion giving this appearance a boost. Stopping down improves sharpness only a small amount at any focal length. Though center sharpness is not bad, good composition typically places your primary subject 1/3 of the distance into the frame - which is outside of the sharpest portion of this lens. Stopping down does improve the vignetting that is noticeable at both ends of the focal length range wide open - especially the 250mm end. A one stop narrower aperture makes a big difference. Barrel distortion on the wide end moves to pin cushion distortion by 100mm or so and gets slightly worse over the rest of the focal length range. You can see this distortion by clicking through the focal lengths in the Image Quality Comparison Tool with a near-distortion-free lens selected for comparison. I have the Canon EF 200mm f/2.8L USM Lens loaded in the link just provided. If the 55-250 shows a larger top-most image than the mouse-over comparison, it is showing barrel distortion - smaller indicates pincushion distortion. 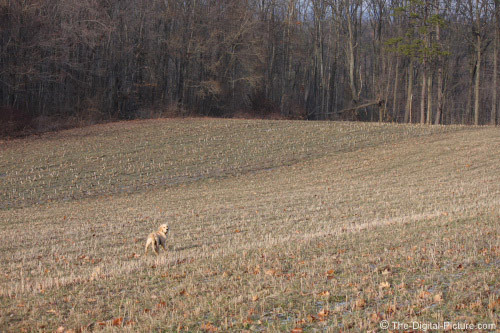 The 55-250 IS delivers relatively low contrast (see the mouseover comparison below). On the positive side, flare and CA (Chromatic Aberration) are very well controlled and I'm not noticing any color cast. But this lens is not a good choice for sports. Even though the focal length range is excellent for this use, combining a relatively slow focusing lens with a relatively narrow max aperture opening gives you have a lens that is not going to work well for many action sports applications. IS is not going to help here unless you are attempting panning motion-blurred shots. I could show you an infinite number of comparison samples, but the above 70mm comparison shows a sharpness and contrast difference nicely. This is a 100% crop taken from approximately 1/3 of the way into the right side of the frame. For comparison purposes, the flat/low contrast "Neutral" Picture Style was used for processing these RAW 40D pics. Sharpening set to "1" (very low) was the only adjustment made. All lenses were set to the marked 70mm focal length, though they are not quite identical in their field of view/magnification at this setting. All three lenses are shown stopped down 1 stop to f/5.6 while the 70-200 is also shown at f/4. The 70-200 is not the "IS" version as the typo in the image claims (sorry). And I'm dangerously assuming you've figured out the mouseover links by now. Obviously, the Canon EF 70-200mm f/4L USM Lens is the best performer in this comparison. Actually, it is the best in all of them. The 70-200 delivers sharper, higher contrast images at all comparable focal lengths, aperture settings and positions in the frame. The 70-200 has less distortion over most of its focal length range. On a 1.6x body, it will show less vignetting at the wider apertures. It has a fixed wide aperture that becomes faster than the 55-250 at 74mm and is a full stop faster at 154mm. The 70-200 has a professional grade build quality and fast, quiet Ring USM AF. The 70-200 is compatible with all EOS bodies including full frame film and digital models. To the 55-250's advantage is that it is less prone to flare, retracts to a smaller size, weighs less, has a longer focal length range, has IS and costs noticeably less. The 70-200 f/4 is available in an IS model, but this is an even more expensive lens. The difference between the Canon EF-S 55-250mm f/4-5.6 IS Lens and the Canon EF 70-300mm f/4-5.6 IS USM Lens is not as clear. The 55-250 has less play in the barrel than the 70-300, but the 70-300 is more solidly built including a metal lens mount. The 70-300 is larger and heavier. The 55-250 has a more-matte finish. While the focus ring on both lenses turns during AF, the 70-300's focus ring does not manually turn in AF mode. This makes lens hoods and filters easier to install/remove, but makes parking the lens in the most compact size more difficult (though you are not supposed to turn the focus ring on the 55-250 in AF mode either). While the 70-300 has USM AF, it is Micro USM - not Ring USM - and is not greatly different from the 55-250 in AF speed. The 70-300 is compatible with all EOS bodies including full frame film and digital models. To the 55-250's advantage is that it retracts to a smaller size, weighs less and costs noticeably less. 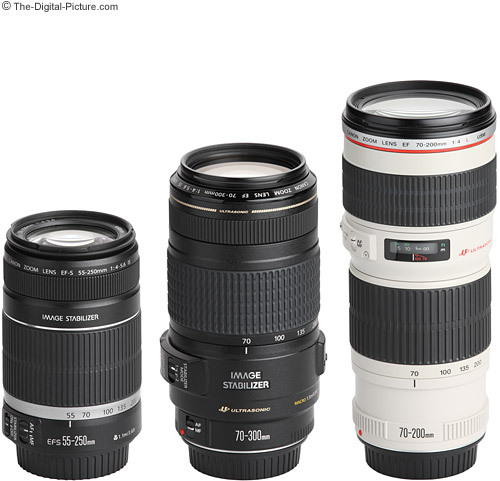 My recommendation is to get the Canon EF 70-200mm f/4L USM Lens over the 55-250. I think you will appreciate the better image quality as well as the high end physical features - the extra cost is worth it in my opinion. The Canon EF 70-300mm f/4-5.6 IS USM Lens is also a better lens, but less definitively so. Though I don't think the Canon EF-S 55-250mm f/4-5.6 IS Lens is great in terms of image quality and features, we can't lose sight of the fact that it is very inexpensive IS tele-zoom Lens. There is a niche for this model. A casual shooter who is happy with their Canon EF-S 18-55mm II or 18-55 IS Lens and needs a tele-zoom for infrequent use could be happy with this lens. This is a light and small lens built to relatively tight tolerances that delivers decent center-of-the-frame image quality and Image Stabilization for a low price.